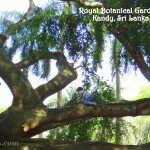 Kandy is a fascinating city – the religious and cultural heart of Sri Lanka. 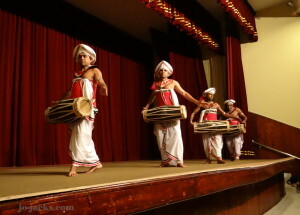 And the drum show in Kandy is a thrilling experience for children. For all 45 minutes my three young children were silent and mesmerized. I can’t think of anything else with that effect for that long – not even ice cream or TV cartoons. The show we attended was in a Town Hall, right next to the lake and across from the temple. Our excellent driver/guide secured us tickets in advanced and whisked us up to seats in the front row. We arrived about 15 minutes early. This is a casual affair – no need to dress up. The show signals it’s beginning with a flute, followed by a trio of drummers. 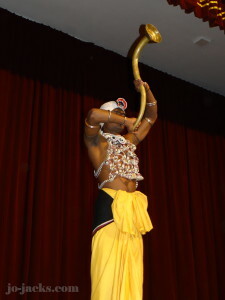 There are performances by alternating female groups and male groups. 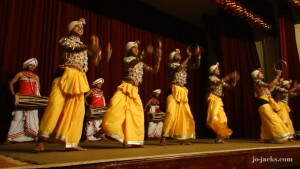 You will see incredible traditional costumes and be rocked by the sound of drums and flutes. We all loved the acrobatic feats you’ll see during some of the songs. And at the end of the show, while others were going up to the stage for pictures, our guide again whisked us into a great position to watch a show outside. 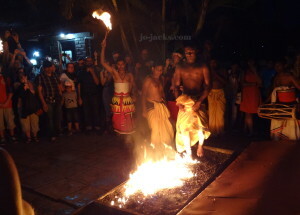 The finale is a demonstration of walking over burning coals. This left quite an impression on the boys and I sure hope they won’t try this at home. Overall this is a fun and interesting show which doesn’t drag and keeps the children entertained (if not partially terrified). 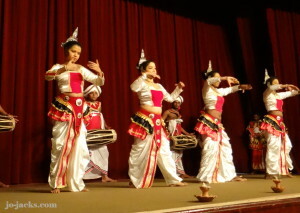 For educational activities related to the Kandy Drum Show, please click here. 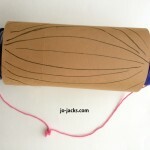 ← Beach Travel Education: Sea Turtles & Coconuts!